I have decided to invent a new holiday. One that I'm positive can't offend all the First Americans Indians. But first? A little back story. Yesterday I received a letter from a blog reader who has become a friend. Reading through this letter, I had tears streaming down my face and joy in my soul. I won't share the private contents of the letter here, but I will tell you this: This girl is an absolute rock star. She, who is all kinds of awesome herself, was thanking me. It got me thinking about the new type of friendship that the Internet has given birth to: The Internet friend. And I'm definitely not talking about the kind of Internet friend who wants to meet you at your house and then is surprised when Dateline: To Catch a Predator is there. No one should have any of those kinds of Internet friends. I'm talking about the friend who is in the motherhood trenches, the same as you. The friend whose blog you might read on your lunch hour, clear across the country, or even across the world. The ones you have met in real life; and the ones you have yet to meet. The people who tune in every day to blogs, hoping there are snippets from what you are sure is no ordinary life. These are the people who get you. And the people whose words touch your heart, make you laugh, or tell you that you are not alone. The people who make our day a little bit better with their stories, photos, and wit. So what I am proposing is this: Let's start a Thanksgiving revolution today. Think of someone you know (or don't know) whose blog you read. Send them a simple note, letting them know what their words have meant to you. Or simply thank them for continuing to entertain you. It doesn't need to take long - just a few minutes to type a note. Imagine what that thoughtfulness will mean to someone. Their day is going to no doubt be hectic today; maybe they are traveling. Maybe they are cooking for inlaws. Maybe they are all alone. But to inboxes across the world, let's spread a little love. We'll call it Giving Thanks for Thanksgiving. I know what my letter meant to me. Imagine if every single one of you gave that feeling to someone else. Just think of all the love flying around the Internet today. And just like the old adage that it's better to give than receive, imagine how great all of US will feel in return. Go, internets. Fly out to the world with your good deeds. Then return and bring us word. How awesome was our first ever How-To Tuesday? It was so awesome. Seriously. Made my day. You need to click through and read every post. (Except for my idiot brother who thought it would be funny to link back to me. Whatevs.) They were fantastic! I am so happy you all decided to play along. If you missed it this week, start thinking of ideas and join in next Tuesday. Really, anything will work. How to make cookies. How to get marker off a wall. How to successfully carry on a telephone conversation with children nearby. How to eat cookies and not get fat. Anyone? Anyone have the answer to that one? I'll pay. Really, I will. Stie has gone global. Be afraid. Be very afraid. Hello, peeps. Can I just say thanks? Thanks to all of you who played along in our little mapping game. It was so fun for the kids and I all weekend. They rushed over to the computer every time it made the little 'ping' letting us know there was a new comment. Made the days go by so much faster. And, hello? Some of you get to live in just about the best places ever. I am highly jealous. I would love to live in a little fishing town in Scotland. Or Denmark. Or Australia. Heck, on this cold day, I'd happily take California. 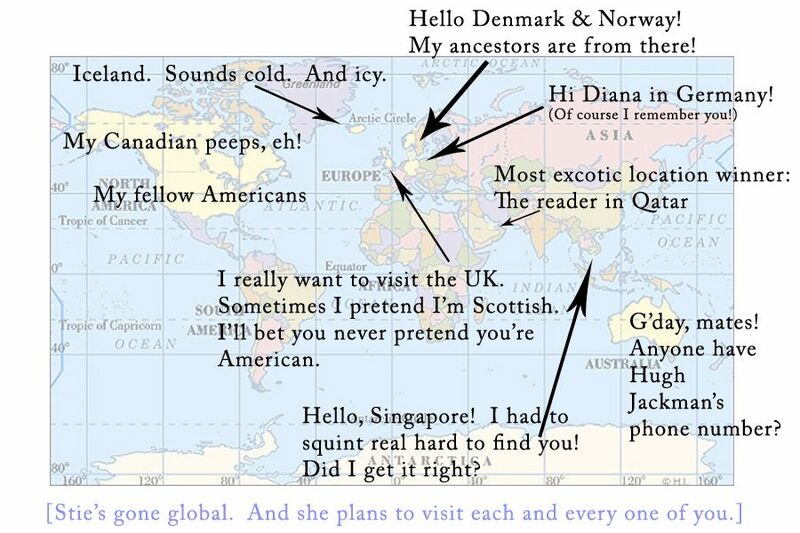 I am highly intrigued by the reader living in Qatar, however. In my ignorance, it sounds positively terrifying. And the reader in Singapore! Sounds very exotic. But maybe the grass isn't greener. Maybe you wake up in your respective cities, bored, tired, hungry, and head off to work. Or you grit your teeth and clean up spilled milk, wishing desperately to be somewhere else. Somewhere really exciting like Missouri. Nah. Pretty sure your lives are awesome. 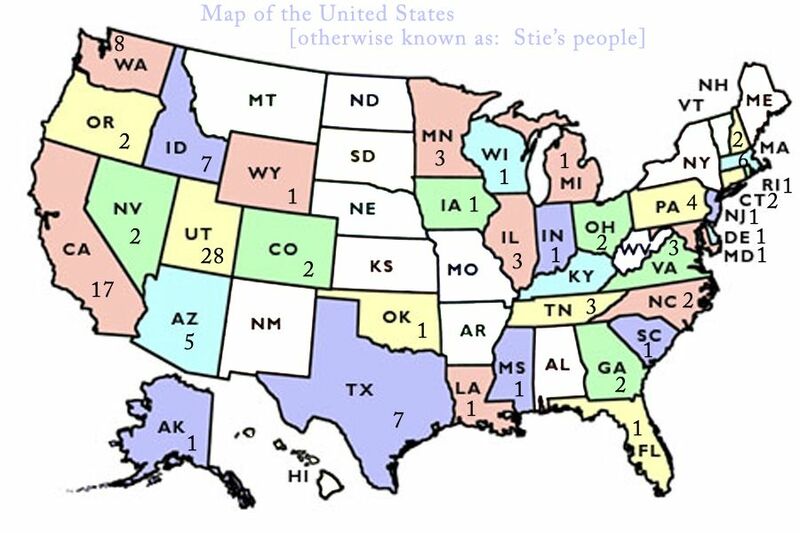 Anyway, here is the rundown, with the states highlighted in white having no commentors. Clearly, I am not loved in the Dakotas. Or that big chunk that runs down through Arkansas. As you can see, I am represented by you fine people elsewhere though. I am highly adored by the good people of Utah, with California a close second. Ironically, no one from my own state of Missouri commented, though theoretically I have friends and peeps here. I'm pretty sure a few of my real-life friends read. But maybe not? Maybe I'm not as cool as I think I am. Oh well. At least I'm loved in Australia. And maybe one of the readers down there knows Hugh Jackman? If you see him, tell him to call me. Anyway, thanks for keeping us busy and entertained on what could have been an otherwise hard weekend. You are the best. And if any of you have guest rooms and would like me to visit, just say the word. I'm just generous enough to impose myself upon you for weeks at a time. Except Qatar. I'm slightly scared of things over in that neck of the woods right now. Matter of fact, Qatar, shall I ready my guest room for YOU? **Updated to add: I misappropriated my Netherlands reader! So sorry - you mentioned being from Minnesota, and I put the tally there by mistake. I have people in the Netherlands! Woo! Oh, internet. Words cannot begin to express my gratitude at your heartfelt empathy, sympathy, and love on my behalf. You are just plain good. When I think that the majoirty of you have never even met me in real life, your sweet words are that much more touching. Thank you. Thank you from the bottom of my heart. It was not easy to put that post out there. It is hard for me to put my weaknesses on display - be they real or perceived. I have a hard time letting my guard down. But this blog has become such an important record of my life that I felt I could not let such a soul changing, monumental experience go unwritten about. And yet you embraced me anyway. And made me wish we could all sit around in my living room, large slices of coconut cake on our laps, and laugh and cry over it all in person. Please tell me there is a way to make that happen? Someday? Anyway, when I saw this video on my real-life friend Katie's blog - I knew I had to share it here and make it my new motto for the year. I love it. Made me laugh and made me cry. My two favorite emotions rolled into one. No more looking back. Only moving forward.